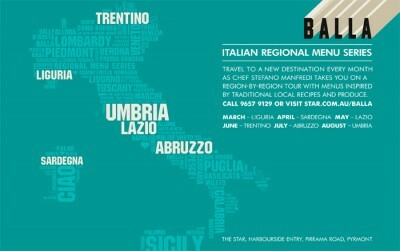 Join Stefano Manfredi and Gabriele Taddeucci and the team from Balla as they continue their culinary journey through regional Italy. Commencing in March with a menu inspired by Liguria, which stretches around the coast from the French border in the west to Tuscany. Liguria has one of the most varied and inventive cuisines of Italy with a large focus on seafood which will inspire the menu. Guests will enjoy an antipasto of Frisceu di bianchetti (whitebait fritters) and a Secondi of Frutti di mare al cartoccio (seafood cooked in a bag Ligurian style). Those who attend the opening night on the second Tuesday of each month will have the benefit of hearing Stefano speak about the inspiration behind the menu and will receive complimentary matching wines.